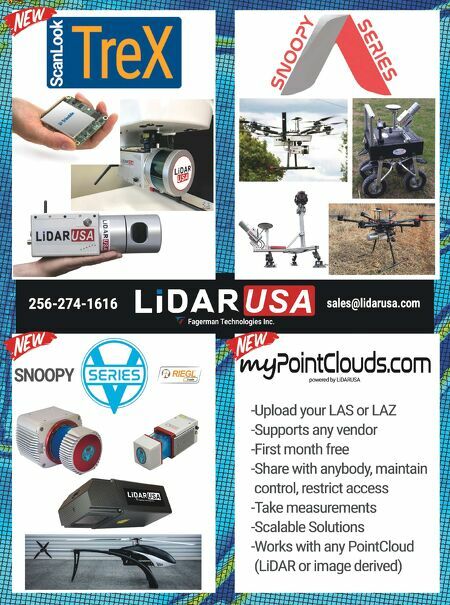 AIR EMERGENCY RESPONSE 44 June/July 2018 unmanned systems inside and determine what a pilot's skill level is," Robinson said. "During Harvey, you couldn't tell if a pilot had zero training hours or 10,000. You had to take people's word for it, and many times we had rogue operators where we were the only ones authorized to f ly. We need to have a way to vet people." MISSION AND DATA MANAGEMENT Communicating and finding a way to quickly get emergency personnel the information they needed was one of the biggest challenges, said Jarrett Broder, director of special projects for the Emergency Management and Homeland Security program at Florida State University and deputy director of the Center for Disaster Risk Policy (CDRP). Broder and his team deployed as part of Florida Task Force 8 and helped with search and rescue missions right after the storm hit in Putnam County. Once they were released, they moved to Collier County to assist with critical infrastructure inspections. They provided data for close to 200 structures, including power TO LEARN MORE ABOUT how drones can be used in search and rescue operations, read "Drones and First Responders: Help From Above," insideunmannedsystems.com RELATED STORIES ONLINE substations, fire houses, prisons, airports and water treatment facilities. They also worked with CRASAR during the Harvey response. "Mission management was difficult mostly because we didn't have reliable communica- tions. Cell phone systems were down so that meant no voice phone calls could be made and we couldn't pass data over mobile networks. It was difficult to keep track of the assets and pi- lots and the status of the mission they'd been assigned," he said. "Data management was a huge issue because we didn't have access to the Internet. Data had to be moved from computer to computer via our own internal WiFi network or with USB drives. We were literally doing data dumps at the end of the day and walking drives over to the GIS guys at Collier County. And we couldn't just give them the data. It had to be in an organized manner." During emergency responses, UAS teams can't rely on systems that rely on the Internet, Broder said. Even if there is Internet access, it will be spotty and connections will be slow. One solution is using off line software to create assets such as orthorectified maps. Todd sug- gested mesh networks and microwave Internet links as options, and Hendrix said a tethered UAS could serve as a hot spot. Moore and his team were able to live stream many of their missions to the emergency op- erations center, and when they couldn't they'd make sure a USB drive with the data was sent to the correct people right away. They used DroneSense, which provides both airspace and video management. Through DroneSense, the live video stream goes to a secure server that officials can access with a login. The team now uses cell signal boosters. These big antennas allow them to reach cell sites that are further away if the closest ones are down. "If you don't have a plan to validate that data was captured properly in the field, you'll be in trouble," Todd said. "And if you don't' have a way to get the data where it needs to be in a timely fashion, the value of the data will diminish. 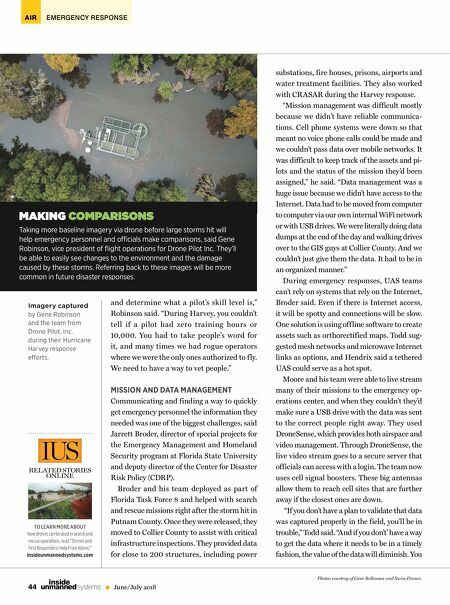 You MAKING COMPARISONS Taking more baseline imagery via drone before large storms hit will help emergency personnel and offi cials make comparisons, said Gene Robinson, vice president of fl ight operations for Drone Pilot Inc. They'll be able to easily see changes to the environment and the damage caused by these storms. Referring back to these images will be more common in future disaster responses. Imagery captured by Gene Robinson and the team from Drone Pilot, Inc. during their Hurricane Harvey response eff orts. Photos courtesy of Gene Robinson and Swiss Drones.